We've been hearing about it for quite some time, and now we get a chance to taste the fruits of Sony's labor. It's action, it's adventure, it's... aptly named. Is it everything it could be? We'll begin with the combat, and everything the system entails. 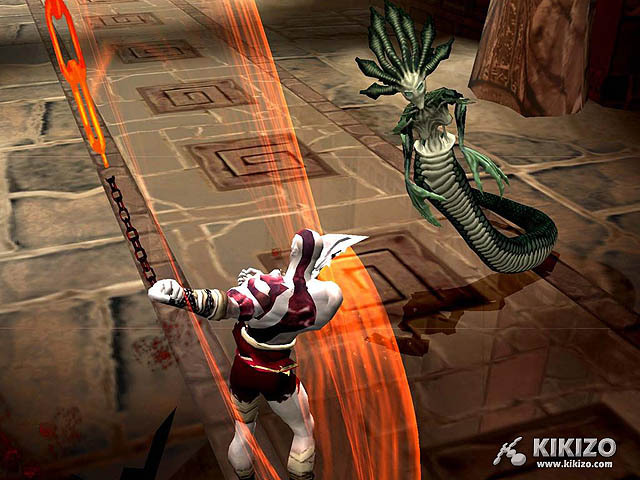 Kratos attacks with the Chaos Blades, chained to his wrists. He can swing them far and wide, striking his enemies with a variety of deadly attacks. He will also obtain another weapon about halfway through the quest, the Artemis Blade, although the Chaos Blades remain the most effective. The combos he can perform are swift, numerous, and devastating. Mastering them isn't as difficult as you think, but it will take some practice to pull off strings of combos that look spectacular and deal massive damage. Now, while this is all well and good, I know what you're thinking- I've seen and played this before. Well, I hate to burst your bubble, fellow action aficionado, but you haven't. 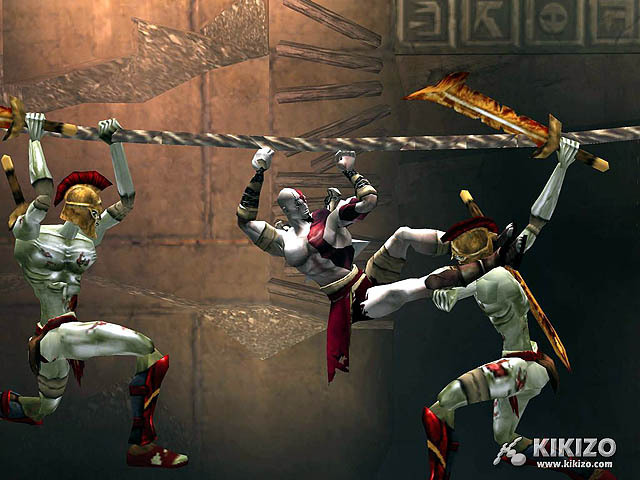 Kratos can grab an enemy with his hands to rip them apart, slam them to the ground, hook them with his weapon, and best of all, he can exploit an aspect of the gameplay that is borderline ingenious. When battling most enemies, once you've worn them down, the Circle button appears over their heads. 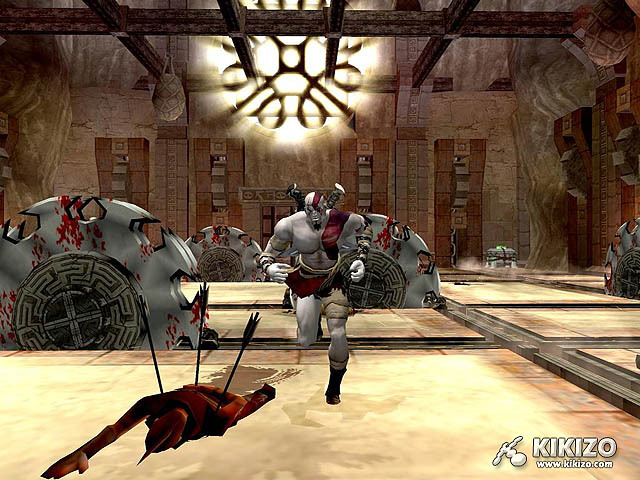 This is when Kratos can grab the enemy and finish them, and it will then require you to play a quick mini-game, known as Context Sensitive Attacks, when you attempt it. 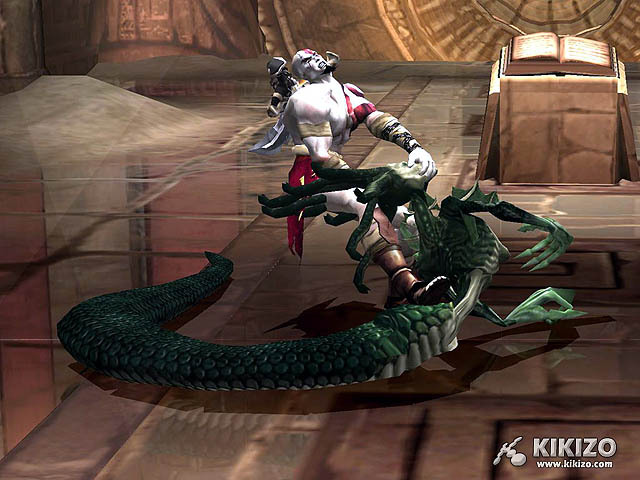 For example, you grab a Medusa to finish her, and the first of three prompts pop up over her head. The first is depicting the analog movement from down to up, the second is the opposite, and the third is one full rotation of the analog. The trick is that the movements are never the same, and if it's a different enemy, it might be button-presses rather than analog movements. 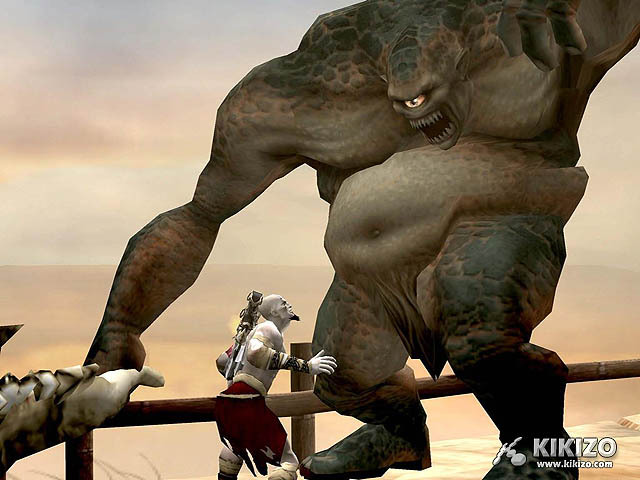 The huge lumbering club-wielding Cyclops will force you to hit three buttons in succession to finish them; it's easy enough, and with each successful press, Kratos avoids their attack and counters. This system becomes even more prominent with bosses, and the player will recognize this in the first hour of the game when the massive boss, the Hydra, is fought. The creativity and ingenuity displayed in that one boss battle must be experienced by any avid gamer, so that they may fully appreciate the words of this review. Couple this unique and engaging system with the weapon combos and magic, both of them essential and upgradeable, and you have a fully developed, well-oiled machine. 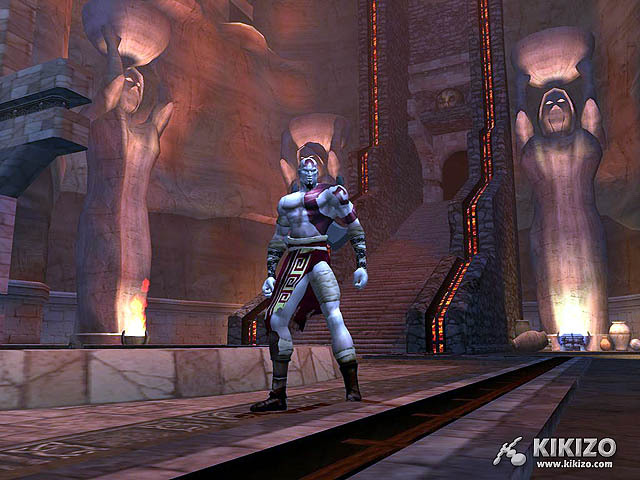 The enemies will give you a run for your money, but you won't feel like you're simply trying to survive, like you might in Devil May Cry 3 or Ninja Gaiden. By getting used to the block command, which, if done correctly, will cause time to slow for an instant and allow Kratos to respond in kind with a counterattack, you can deal with just about anything. And when your defense fails you, you will find that his blades, magic, and abilities are more than a match for your foes. Experimenting is half the fun, anyway. 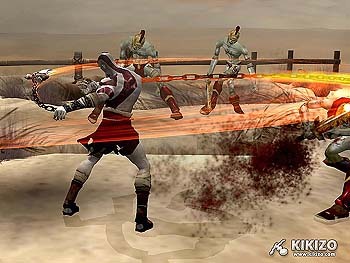 As I mentioned before, this supreme combat system is not the only thing God of War has going for it. 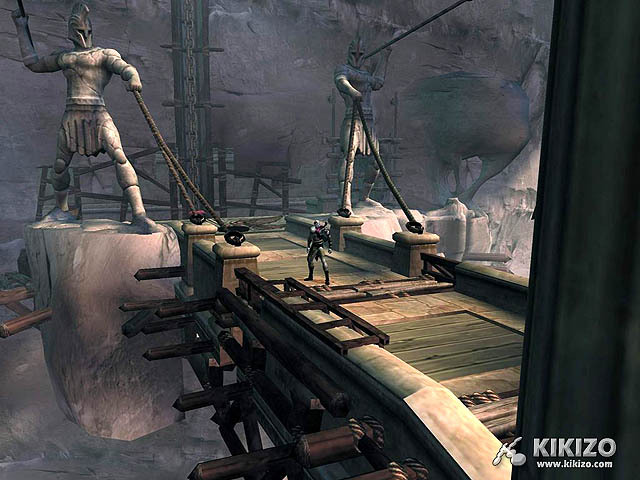 There are largely diverse platforming elements that include jump and double-jump, wall climbing, swinging on ropes, and balancing along beams and other narrow pathways. The fact that they are a large part of the game isn't the amazing part, it's the fact that each is extremely well developed. 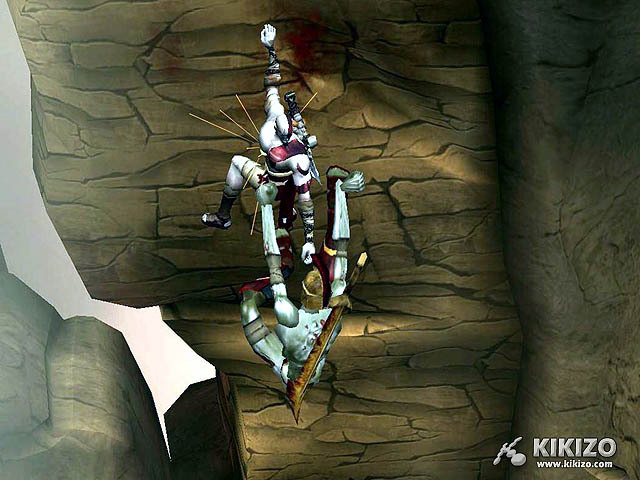 When balancing, Kratos can start to lose his balance, and you can adjust your controls accordingly. If he falls, he'll try to grab the surface he fell from; if the surface allows it, you can press X quickly so he can pull himself back up. 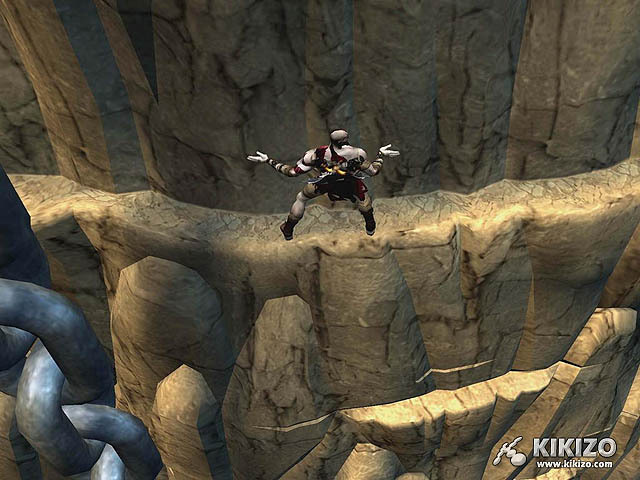 When wall climbing, enemies will sometimes be there with you, and you can attack in all four directions, or if they're close enough, you can grab them, slam them into the wall a few times, and toss them away.